When you use your Android device, all the changes you make in your Office apps are now saved automatically, so you never have to press the Save button again. Your documents will saved periodically, even when you're offline. If you'd rather not have Android auto save for you, tap File > Save, and move the Auto Save slider to Off. 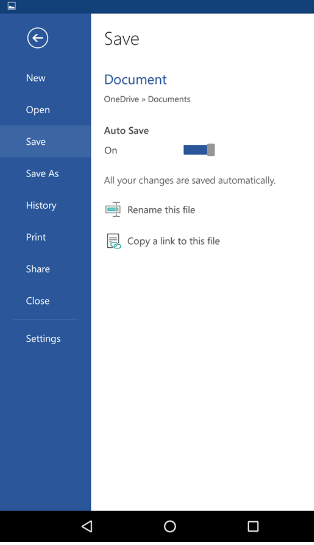 On the file menu, tap Save As. You can save your files locally to your device or save them to the cloud so you can share with others easily.